By default, only one actual tab is created. Tabs are drawings, they do NOT actually contain widgets that are positioned “inside” them. Each Tab can link to a separate screen. Choose a tab from “On Click Tab” on “Advanced” property panel. Widgets that you put “inside” the tabs are displayed no matter which tab you set as active. To simulate screen with multiple tabs, you copy the screen and for each set the different active tab, then place the widgets you need on each screen. 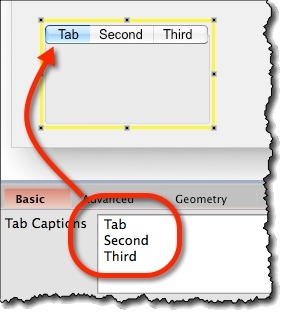 Tab Captions (“Basic” tab) – Specify the tabs here, one per line. 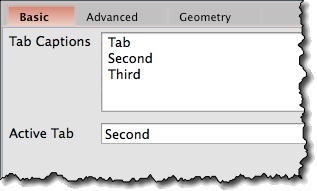 Active Tab (“Basic” tab) – Choose which tab will be displayed as active. By default, it’s the first tab. 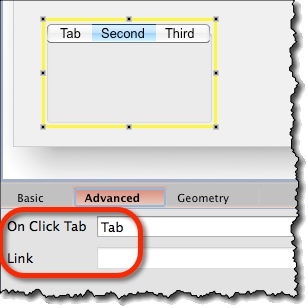 On Click Tab (“Advanced” tab) – Choose for which tab you will be specifying the Link. 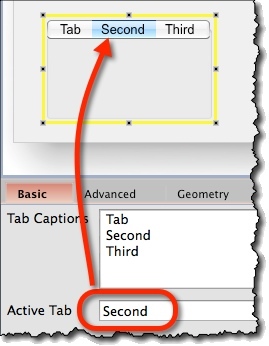 Link (“Advanced” tab) – Specify the link for the Tab specify in the above field.